After-supper activities around our house in the 1950’s didn’t include video games, surfing the web, cell phones or i-pods, and very little television. It did include things like board games of Monopoly, Scrabble, Chinese or regular checkers. 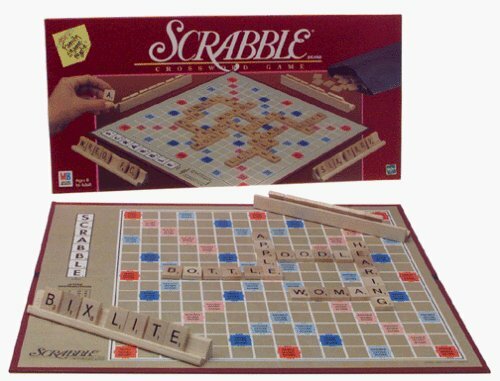 Now, I was pretty good at Scrabble. After all, I was my class spelling champ, I studied words right along with math and geography. As long as my opponents were other kids I did just fine. But if Mama got into the game, she’d have to spot us so many points – she subscribed to crossword puzzle books! Mama could use a handful of z’s and q’s and u’s to make the most outlandish combinations and we’d cry foul. “Look it up,” she’d say with a smile, totaling up her score. “Look it up.” Flipping through the pages of our oversize dictionary, we’d do our best to prove her wrong. Naturally she’d turn out to be right. Card games like gin rummy were more fun and more likely to result in a random winner. Depending on who was in charge, some variety of poker (played for toothpicks, not for money, of course) might be allowed. During summer vacation one year Uncle Mike had taken it upon himself to teach me the elements of a good poker hand and poker face, much to the dismay of my non-gambling grandparents. We used seed corn or bottle caps instead of cash, and after a summer of practice I could beat him occasionally. If I accumulated enough kernels of corn, he’d treat me to a Dr. Pepper or Red Rock Cola. My brother and Mama learned how to play chess one year but my patience for such a high-brow endeavor in those days was entirely too low. Sit and stare at the chess board for a long time, don’t talk, just stare. Finally pick up a bishop or a knight, pretend to set him down in one square but don’t take your fingers off yet. Move him somewhere else, hover over a different square while your eyes rove back and forth, and finally plop him down in another place entirely. Uh uh, too boring for words. I found something to do with faster action, like solitaire. If we didn’t feel like a full-fledged board or card game, we settled for simple pencil and paper games like tic-tac-toe or hangman. No matter what combination of family and friends were in the house, there was always something interesting, educational or just plain fun to occupy our time in the evenings. Before the advent of television in our living room, the table-top radio was usually on in the evenings. 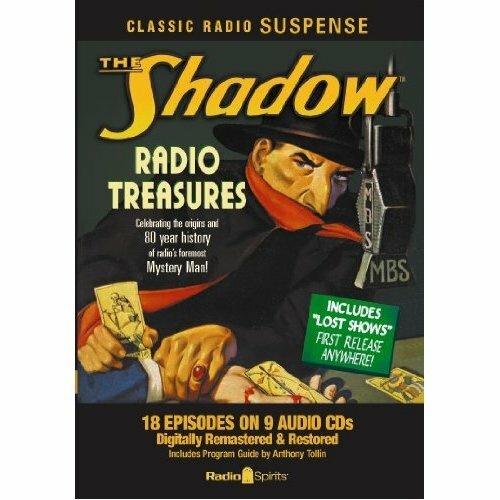 In between board games we listened to Jack Benny, Bob Hope or Burns and Allen, perhaps The Shadow (Who knows what evil lurks in the heart of men? The Shadow Knows!) or Boston Blackie. All these old programs are still available on CD today. I actually bought some Jack Benny, complete with full-length Lucky Strike commercials. Nostalgia galore! If nothing of interest was on the radio, Mama usually stacked several LP’s on the stereo. The Best of the Hit Parade, Easy Listening, Big Band, folk or pop music, even the classics kept us company while we competed for houses and hotels and racked up points. Of course, there were always things to do outside the house between school and supper time, too. Some days there were Cub Scouts or violin lessons for my brother, Brownie Scouts or piano lessons for me. Unorganized afternoons meant we could hang out with friends in a neighborhood playground or stop off at somebody else’s house on the way home. One year my hopeful mother enrolled me in dance lessons. Our little class was supposed to learn the basic elements of ballet and ballroom dancing, starting with ballet. I did strive to get the hang of ballet steps, I really did. First position: heels together, toes out to the side, knees straight. Straight? Forget plies, I never quite achieved first, second or third position. Then came the disastrous afternoon I arrived home without my dance costume – somehow in the few blocks between dance studio and home the bag with my dress of green and lavender ruffles simply vanished. Shortly afterward the instructor informed my disappointed mother that I wasn’t “dance material,” but without that frilly dress my heart wasn’t in it anyway. I never really missed those lessons. These days when there’s nothing but re-runs on TV and I’ve run out of something new or interesting to read, I might settle down to play a game of Mah Jong or Solitaire. They’re on a computer screen, of course. Stashed in a drawer somewhere is an old deck of Bicycle cards but I haven’t dealt a hand with it in many years. And the last time I played Monopoly was when Tim and I joined our church home group for game night, and Tim and the preacher teamed up on the rest of us. Now that was fun! Brought back fond memories of 1950’s Monopoly, Mama, Scrabble and all. There weren’t many free recreational opportunities for Florence families in the 1950’s. In the summer we might drive down to the Black Creek swimming hole or walk to the Timrod Park pool. Once a summer or so we’d make that long drive to Myrtle Beach, if mama packed a picnic basket and cooler. Occasionally there were community concerts at the high school and once in a while somebody put on a talent show at the Colonial Theater. And we’d squint against the glare, following the speck until it was discernible as a plane, then disappeared from view on a far-side runway. “Listen for it, listen!” And soon we would hear the roar of those big engines as the plane taxied into sight. We’d wave and yell as though the passengers, maybe even the plane itself could hear us cheering it on. We’d wait until the engines finally stopped, the tall steps were rolled into place and all those fortunate people began disembarking. Satisfied, we’d prepare to pile back into the car, excitement over. Sometimes instead of heading home daddy would drive us over to general aviation to look at an airplane up close. Two seaters or four seaters, single wing or biplane, many shapes and sizes of planes were parked inside the hanger and out. Sometimes daddy would find somebody to talk to about engine size, airspeed, all that technical stuff. Nobody ever tried to run us off in those days as we walked around, letting our imaginations put us into those cockpits. Sky King! Red Baron! The whole property was a community asset and not just for airplane watchers, riders or flyers. 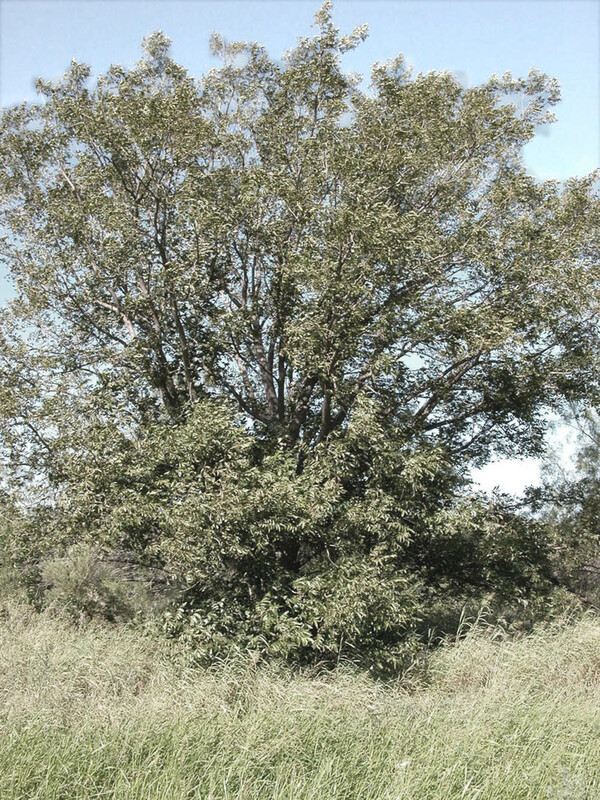 On the Cemetery Road side were large, leafy pecan trees growing near one of the narrow paved roads. When the pecans were prolific, moms brought their children and their paper sacks, parked on the grassy shoulder and picked up enough nuts for Thanksgiving and Christmas pies and fruit cakes. Those back roads were also good places for novice drivers. That’s where my cousin David Allen tried to teach me to drive daddy’s straight-shift Ford. A slipping clutch got the best of me and the car choked off every time I went from first to second gear. Exasperated, we finally gave up on the lesson. But in mama’s punch-button drive Plymouth later on, I practiced driving, turning around and parallel parking, every maneuver that might be called for on my driver’s test, all out there on those airport roads. The light traffic made the airport the safest, yet most realistic place to learn driving for me and most of my friends. We’d drive through the airport over to Cemetery Road, stretching the minutes before going home. We’d pass Marlowe Manufacturing along the way and occasionally another car, making several circuits and passing the ends of unused runways. If it was still daylight, we’d look for the hulk of an old abandoned plane, parked and forgotten on one of those old runways. The annual Agricultural Fair set up on the town end of the airport for many years, with a family-friendly admission charge. Mama and daddy insisted we tour the exhibition buildings before us kids could ride any of the rides. They stopped too often to suit me; they knew too many people in those exhibit booths! Pyramids of home-preserved jelly and jams sat next to quart jars of cucumber pickles. There were gigantic pumpkins and gourds and hand-pieced quilts, blue ribbons pinned on everything imaginable. We’d meander through tractors and disc harrows, finally arriving at our last stop – the baby animals. Trying to pet the piglets or catch a baby chick, we’d lean over the fence rails as mama and daddy congratulated the proud 4H’ers who had raised these adorable creatures. Well, the fairgrounds were eventually relocated down the highway and the old terminal building, hangers and all have evolved into a shiny, new regional complex. Still, I enjoy reminiscing about our old 1950’s airport, especially these days when I have to pay for parking out there. Recess at McKenzie Elementary School was often sports centered – not baseball, football or basketball, but tag, hopscotch, jump rope, and other “team” activities. The boys had their side of the yard, the girls had ours and never the twain did meet, so I can’t speak to what the boys engaged in, but tag and double-dutch jump rope were big things for us girls. We did have real teams, too. The leader, whoever that might be, picked her best friend to captain the opposing team. Sides were then picked, always a daunting necessity. Some girls were good at chase, being taller and long-legged. Some were better at jumping, some at hopping, and some at tripping up the rest of us. I did okay getting picked until about the fourth grade. That’s when the visiting eye doctor checked everybody’s vision and I started wearing glasses. Of course I could see the blackboard much better, but something weird happened to my depth perception on the playground. Nothing was quite where I thought it was any more. 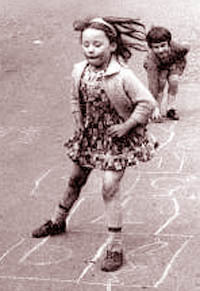 That only messed up my hopscotch skills a little, but running across the schoolyard was suddenly troublesome. Little clumps of grass, pools of rain water or chunks of broken brick kept getting in my way. Soon I became the last one picked no matter what the game, and cheering on the other girls gradually became my “sports” activity. At Poynor Junior High the schoolyard was replaced by the gymnasium, where phys-ed was a more organized affair. Jumping jacks may not technically be a team sport, but they are supposed to be synchronized. I could manage okay if I stuck to the back row, where I couldn’t accidentally cause a disastrous domino effect. Running around the gym in formation was one way to warm-up for half-court basketball, but I always knew that would be it for me. No-one voluntarily chose me for their side if they could help it. Sometimes they couldn’t help it, like when the teacher did the selecting. Both me and the other girls groaned if she ever appointed me to a team. Have you ever shot a basket and just knew it was right on? But the ball had a mind of its own and missed the rim by a hair? Every time? I could plainly see where the basket was, and I could plainly throw the ball in exactly the right spot. But it never was exactly the right spot – the refraction of my eyeglass lenses did something peculiar to all that. After a while even the well-meaning PE coach took pity on us all and let me stick to calisthenics. No more team sports for me. At McClenaghan our physical education classes were shortened and their frequency lessened. Part of the class was spent listening to lectures, part on calisthenics, and part on choosing up sides for basketball or softball. That part of my time was spent on homework. I didn’t mind. I enjoyed watching the teams running and jumping, thoroughly exhausting themselves. Whenever we took the class out to the field behind the school, I sat on the bleachers and read history, occasionally looking up to yell encouragement to the players. You know, there were distinct sports seasons back then. Fall meant football! Naturally the more accomplished females in gym class went out for cheerleading. Go, Yellow Jackets! I watched a few football games during the fall, but I really looked forward to basketball. That didn’t start until after football was over, and it didn’t require sitting outside in cold weather squinting against the field lights to see who was who under their helmets. In the relative comfort of the gym, despite echoes bouncing off the walls and the gallops of so many big feet, the players were quite distinguishable. Then, as winter-time basketball was winding up, softball and baseball got under way and you knew it would soon be spring. Occasional breezes got us through the warm, then hot weather, and I was back to holding down a seat in the stadium bleachers. If we had winning or losing seasons I couldn’t tell you right now, but we sure did have enthusiastic teams and fans. By my last year in high school, even gym class calisthenics were no longer required. Piano lessons, the McClenaghan chorale and choir rehearsals took up my spare time, in between dating. And I was looking forward to college – Francis Marion University was then USC at Florence and thus I pulled for all the Gamecock teams. I still do, but nowadays my own “sports activity” has morphed into flipping the remote control, watching TV while peddling my exercise bike.